The Prolificx Telematics Development Kit is based around the Eagle-250/PE202 processor module. BASED around the Eagle-250/PE202 processor module, the new Prolificx Telematics Development Kit provides a ready-to-go hardware solution to quickly prove concepts and deliver prototypes. 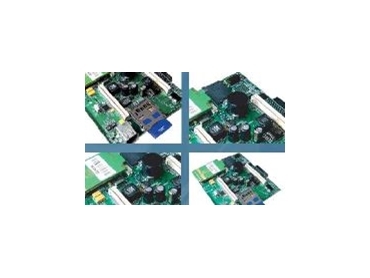 Running the Microsoft Windows CE .NET 4.2 operating system, and supporting multiple displays types with onboard GPS and GSRS modem, the Eagle-250 based Telematics Developer Kit is a suitable starting point for any telematics development. The board has a power supply designed to run off a 12V car or 24V truck battery supplies and is protected against the harsh conditions found in telematics applications. Application software development is supported by the provided software development kit (SDK) and the Microsoft eMbedded range of development tools. Source code of example GPS and GPRS applications in included with the kit along with a complete copy of the Microsoft eMbedded Visual C++ 4.0 development environment. Additional features are always being developed for the Telematics Development Kit. Additional features soon to be released include an embedded Bluetooth radio and collision detection sensors. The product has an Intel Xscale processor, PXA255 running at 400MHz with 32Mb FLASH and 64Mb of SDRAM. The GPS module has battery back-up of almanac while the GPRS modem dual-band provides always on communication. Dual USB host ports (standard Type A) are provided as well as a single USB slave port. The unit has a battery backed-up real time clock (RTC), 10/100BaseTX Ethernet for high speed communication, SD card slot (Utilising standard Secure Digital cards) and Compact Flash CF+ Type II connector with support for WiFi Card. The display is a sharp LQ065T9DR51 LCD (6.5" 400*240 TFT with inverter) with additional generic LCD interface, 16 bit plus 5V supply. Touchsreens are also available, with a four wire resistive touch panel interface. Audio is AC97 codec with line in/out jacks, and the unit is powered by 10V to 30V dc. PE202 is protected for automotive power supply environment.